Which Self-Storage Companies Are Making More Money in 2016? Wouldn’t it be wonderful to have extra income that provides short and long-term financial benefits? Many of your colleagues are enjoying increased profits because they have a solid cell site lease agreement. Our team at Vertical Consultants works with over 20 of the Top 100 Self-Storage companies in North America. Adding a cell site on your property can be extremely lucrative. However, the key to success is making sure that you have a structured lease agreement with comprehensive terms that maximize rent and protects you and your property. 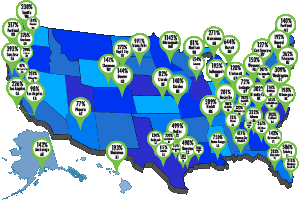 Vertical Consultants has achieved significant rent increases for Uncle Bob’s Self Storage facilities across the nation. “We had an existing cell tower with Verizon. Verizon wanted to terminate the lease. We hired Vertical Consultants to negotiate and secure ownership of the cell tower, and a substantial cash settlement. Shortly thereafter, AT&T approached us wanting to lease space on our newly acquired tower. We hired Vertical Consultants again, and they negotiated and came up with lease rate well over 3 times lease rate when Verizon owned it. This was a huge value-added situation created by Vertical Consultants. “We have cell site leases across the country. “If you want results, contact Vertical Consultants. As the nation’s leading cell site consulting firm, Vertical Consultants has secured over $150,000,000.00 in cell site rents for clients across North America since 2010. In 2015, Vertical Consultants averaged an 338% immediate increase in cell site rents. Contact a member of the Vertical Consultants Team to find out how to generate more revenue for your Self-Storage business.